I recently tallied up the hours that I have spent in the saddle, having been raised on a horse farm from youth, and discovered that if I include pleasure and show time together, I have over ten thousand horseback rides under my belt. Needless to say I have incorporated two of my favorite past times over the years, that of camping and horseback riding. While there are some disadvantages to taking a horse, (or horses rather), with you on a military surplus tent adventure, there are more reasons to do it than not to. Here are three specific reasons that you must start incorporating your equine friends with you on a camping trip, especially one where you will want to take a good, solidly built military surplus tent. 1. Horses can eat grass. 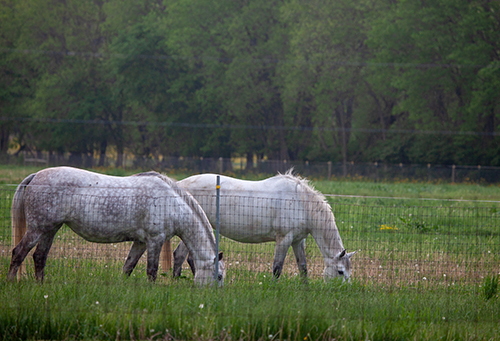 While it's nice to have some grain for your horses as a treat for working for you, you don't have to carry provisions for them, because the fuel that they need to go on grows naturally in the wild. Unlike an ATV, or any other form of transportation, horses are cheap to have along. 2. Horses can carry heavy loads. While ordinarily you would be restricted to many areas that you can go with a military surplus tent because of it's weight, having a horse greatly increases your range. 3. Horse make great advocates. With their incredible strength, great sense of smell, and light sleeping habits, horses make great advocates in times of trouble as the link to the video below shows well.